NEW YORK (CNNMoney) -- U.S. stocks closed mixed Thursday, with the broader market falling for a third day, amid renewed worries about the debt crisis in Europe. 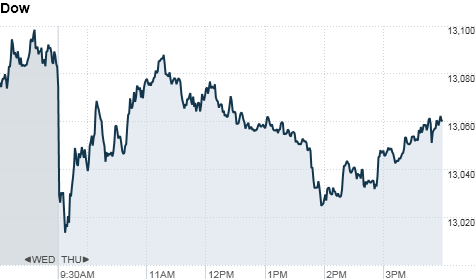 The Dow Jones industrial average (INDU) slid 12 points, or 0.4%, to end at 13,060. The S&P 500 (SPX) eased 1 point, or 0.1%, to 1,398. The Nasdaq (COMP) rose 13 points, or 0.4%, to 3,080. Traders said volumes were low Thursday with many market participants absent ahead of the holiday. U.S. markets will be closed Friday in observance of Good Friday, and bond markets will close early. The Dow and S&P 500 both fell for a third day, ending the four day week lower. Despite modest gains on Thursday, the Nasdaq also ended the week down. All three indexes suffered the largest weekly decline of 2012. Stocks opened lower Thursday as investors continued to digest Wednesday's lackluster auction of Spanish government bonds. The yield on 10-year Spanish bonds jumped to 5.8% Thursday amid worries about the government's budget deficit. "Credit concerns are flaring given the rise in Spanish bond yields," said Nick Kalivas, market strategist at Hadrian Partners. "It feels like the sovereign debt crisis is surfacing again." In addition, investors have been sidelined this week by concerns the Federal Reserve may not launch a third round of quantitative easing when the current program, known as Operation Twist, ends in June. "Traders may soon be forced to operate without a safety net for the first time since the 2008 collapse," said Karl Schamotta, senior market strategist Western Union Business Solutions. "The implications will be profound." Meanwhile, the U.S. job market has been in focus this week ahead of Friday's report on hiring and unemployment from the Labor Department. Two reports released Thursday pointed to continued improvement in the labor market. Stocks fell Wednesday after minutes from the Fed's latest policy meeting dashed hopes for additional stimulus from the central bank. Sell in April and hide under the table? Meanwhile, demand for U.S. Treasuries rebounded Thursday after prices fell sharply earlier in the week, said Guy LeBas, chief fixed-income analyst at Janney Capital Markets. But the gains came on low volume ahead of Friday's holiday. "The combination of the impending Good Friday holiday, prevalence of school spring breaks this week, and the start of the Masters Golf tournament Wednesday afternoon all conspired to keep volumes low," LeBas said. Economy: Initial jobless claims for the week ended March 31 totaled 357,000, the government reported before Thursday's opening bell, compared with analyst expectations of 355,000. Outplacement firm Challenger, Gray & Christmas said planned job cuts declined to roughly 38,000 in March, the lowest since May of last year. On Friday, the Labor Department will release the latest update on job growth and the unemployment rate. Economists surveyed by CNNMoney expect that report to show employers added 200,000 jobs in March and the unemployment rate fell to 8.2%. In February, the economy added 227,000 jobs. World markets: European stocks ended mixed. Britain's FTSE 100 (UKX) added 0.3% and France's CAC 40 (CAC40) rose 0.2%, but the DAX (DAX) in Germany lost 0.1%. In a widely expected move, the Bank of England's monetary policy committee voted to hold interest rates at 0.5% and maintain the size of its 325 billion pound asset-purchasing program. Meanwhile, the International Monetary Fund said Portugal has made "good progress" on its economic reform program and approved the disbursement of €5.2 billion in bailout funds. Asian markets ended mixed. Japan's Nikkei (N225) slid 0.5% and Hong Kong's Hang Seng (HSI) fell 1%, while the Shanghai Composite (SHCOMP) rose 1.7%. Companies: Shares of wine company Constellation Brands (STZ) fell after the company reported a drop in revenue and weak guidance for the upcoming fiscal year. Pier 1 Imports (PIR) and Carmax (KMX, Fortune 500) reported earnings and revenue roughly in line with analyst expectations. Macy's (M, Fortune 500) shares rose after the company reported that its same-store sales for the month of March had increased 7%. Fellow retailer Bed Bath & Beyond (BBBY, Fortune 500) gained after announcing a 7% increase in quarterly same-store sales. Clothing sellers Gap Inc (GPS, Fortune 500) and TJX Companies Inc (TJX, Fortune 500) were up on strong same-store sales. Costco (COST, Fortune 500)'s March same-store sales in the U.S. increased by 6%. Limited (LTD, Fortune 500) said March same-store sales increased 8%. Currencies and commodities: The dollar gained against the euro and British pound, but slipped against the Japanese yen. Oil for May delivery rose $1.84 to end the day at $103.31 a barrel. Gold futures for April delivery rose $16.20 to settle at $1,628.50 an ounce. Bonds: The price on the benchmark 10-year U.S. Treasury rose, pushing the yield down to 2.19% from 2.23% late Wednesday.